Amit Shah’s son said he would sue the author of the report and the editors and owners of the website for criminal defamation. A report in the online news portal The Wire about the business dealings of BJP president Amit Shah’s son Jay triggered a political storm Sunday, with the Congress asking whether Prime Minister Narendra Modi would order an inquiry by the CBI or Enforcement Directorate, and the BJP calling the report “false” and defamatory”. “We finally found the only beneficiary of Demonetisation. It’s not the RBI, the poor or the farmers. It’s the Shah-in-Shah of Demo. Jai Amit,” Congress vice president Rahul Gandhi tweeted. The CPI(M), AAP, Samajwadi Party and RJD too used the report to attack the BJP, Amit Shah and Modi. 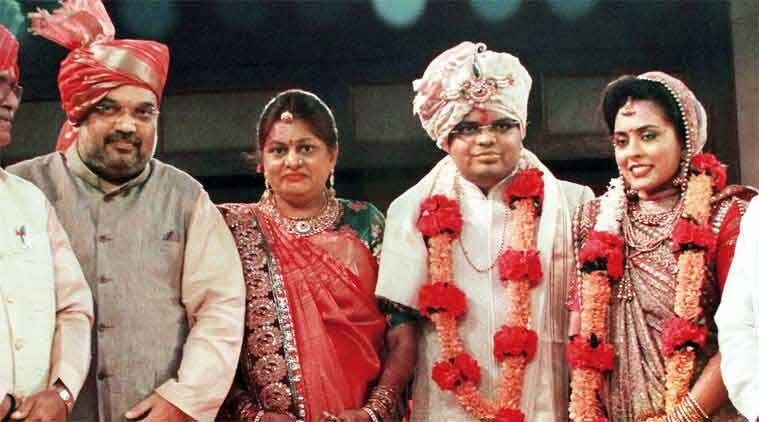 The report in The Wire said the turnover of Temple Enterprise Private Ltd, a company owned by Jay Shah, grew from Rs 50,000 in March 2015 to Rs 80.5 crore in 2015-16, a year in which it got access to an unsecured loan of Rs 15.78 crore from financial services firm KIFS. While the report questioned the sharp rise in turnover of Temple Enterprise in 2015-16, Shah’s lawyer said the company is in the business of import and export of agri commodities like rapeseed DOC, castor DOC meal, desi chana, soyabean, coriander seeds, rice, wheat, maize etc. A turnover of Rs 80 crore in the commodity business is not “abnormally high”, he said. The report also talks about Shah’s another company Kusum Finserve, a limited liability partnership, incorporated in July 2015. It says Kusum Finserve got inter-corporate deposits from KIFS Financial worth Rs 2.6 crore in FY 2014-15, and an unsecured loan of Rs 4.9 crore. The report highlighted a Rs 25 crore loan taken by Kusum Finserve from Kalupur Commercial Cooperative Bank, and asked how this loan was raised against collaterals valued at Rs 7 crore. Shah’s lawyer responded, according to the report, that “the bank did not give the firm a loan but a non fund based working capital facility in the form of a Letter of Credit up to Rs 25 crore. This facility is availed from time to time”. The report also speaks about the LLP availing a Rs 10.35 crore loan from a public sector enterprise, Indian Renewable Energy Development Agency (IREDA). In response, Shah’s lawyer has been quoted as saying: “The loan taken from IREDA for setting up a 2.1 MW wind energy plant is based on the equipment prices prevailing at that point of time as per industry standards (approx Rs 14.3 crore) and duly appraised and sanctioned in the normal course of business. The outstanding loan as on 30-06-2017 is Rs 8.52 crore and interest and repayment of loan are regular.”While the report said Temple Enterprise’s reserves and surplus jumped from Rs 19 lakh to Rs 80.2 lakh in 2015-16, the company had actually reported a decline from a positive Rs 19 lakh in 2014-15 to a negative Rs 80.2 lakh in 2015-16. The figure of Rs 80.2 lakh stated in the balance sheet was in parentheses, which means negative. Jay Amit Shah said the report had made “false, derogatory and defamatory imputation against me by creating in the mind of right-thinking people an impression that my business owes its ‘success’ to my father’s political position. “My businesses are fully legitimate and conducted in a lawful manner on commercial lines, which is reflected in my tax records, and through banking transactions. I had taken loan either from NBFC or Non-Funded Credit Facilities from Cooperative Bank on purely commercial terms strictly in accordance with law. “I have repaid the loans by cheque on commercial rate of interest and within the time stipulated. I have mortgaged my family property with the cooperative bank to get the credit facilities,” he said in a statement. Jay Shah said he would file a criminal defamation suit worth Rs 100 crore against the author of the report, and the editors and owners of the website. At a press conference, Railway Minister Piyush Goyal said the report was “absolutely false, baseless, malicious, derogatory, defamatory and hollow”. Jay Shah’s business was fully legitimate and lawful, he said. “It’s all in his account books, and his income-tax returns and all transactions are through that. I don’t think there is any bar in this country on taking a loan from the bank or NBFC and all the loans have been taken strictly in accordance with law on commercial rates of interest and commercial considerations. Securities have been provided and the loans taken from the NBFC have been fully paid along with interest after deducting tax at source,” Goyal said. “Unfortunately,” Goyal said, “the business suffered losses and Jay had to close down the business by October 2016, nearly one year ago”. Goyal’s response came after senior Congress leader Kapil Sibal held a press conference on the allegations against Jay Shah. After Goyal’s response, Sibal held a second press conference and asked why Goyal, a union minister, was defending a private person. Sibal said filings with the Registrar of Companies by Temple Enterprise Private Ltd, which was incorporated in 2004, showed that in March 2013 and in March 2014, the company recorded losses of Rs 6,230 and Rs 1,724 respectively. “But in 2014-15 it started making profits… that means there was some change in May… The real change which is shocking came in 2015-16… when the company recorded a turnover of Rs 80 crore… The company also started getting loans,” Sibal said. “But the company stopped business activities in October 2016. And the reason stated was that the company was incurring losses. The losses were said to be 1.4 crore. So first it was incurring losses, then the turnover became Rs 80 crore and then again it started incurring losses and company stopped business… This is indeed strange,” Sibal added. “Today, we want to ask our Prime Minister, what do you have to say about crony capitalism now? Will you direct the CBI to probe? Will you direct the ED to probe? Will you ask them to arrest them? Because in the case of opposition, the ED immediately sends notice and shows speed in arresting them… But if somebody’s name is Jay, Amit and Shah, who can arrest them? I can confidently tell you that the Prime Minister will remain silent,” Sibal said. The Aam Aadmi Party said the case showed the symptoms of being a “classic case of money laundering”.